We’re just back from a two week jaunt to Alicante in Spain. The total distance was 3,354 miles and we averaged 36.9 mpg, which was marginally better than the 36.4 we achieved on the trip to the Picos de Europa last year (see blog post Roscoff to Stourbridge) . While Jacqui was driving on the last day I went onto a Pistonheads forum and asked whether I could do better than the GT86 for a £30K sportscar / 2+2 which could average 36 mpg on a roadtrip. There was a good discussion and I think we concluded that if we rule out hot hatches (which I do) and all diesel cars (which I also do) then there isn’t really anything. There was some debate as to whether the GT86 is a sportscar and some suggestions for things like the Elise, but having owned one and also done a few European journeys in a Honda S2000, the GT86 is definitely the most comfortable and most practical. So practical in fact that when my youngest son flew out to Alicante to join us for a few days we could pick him up in it and we even drove to Valencia and back with him in the back and with no complaints. I have thought about getting an Abarth 124 Spider but you couldn’t do that in one of those. As mentioned in the previous post we crossed the Channel through the Eurotunnel, which is our favoured way over to France. However, we did try something new this year which we have not used before. These are toll tags. My brother-in-law recommended them and they are brilliant. You have one for each country and they stick onto the windscreen behind the rear view mirror. Then when you approach a motorway toll, instead of stopping and paying (always a hassle in a low right-hand-drive car on the continent, even with a passenger), the tag beeps and the barrier rises (and your bank account is debited). So satisfying to pass the queues of people hunting for change or their mislaid tickets. They are also brilliant for hiding the costs of all of those tolls from you. Normally, after paying, we say to ourselves that we should really try to avoid the toll roads. These things lull you into thinking that they’re free! I daren’t look at the bank account! It took us three days to get down to Oliva just north of Alicante, stopping at Mâcon and then Figueres. Jacqui thought the road down through France was boring (which it was) so for the return journey we took an extra half day and went via Andorra in the Pyrenees. Our return journey looks a bit odd when plotted on the map but we called in to see some friends in Auvillar and that pulled us a little west. Anyway, the return journey was much more interesting. Some may wonder why we avoid Paris. Lots of people go that way and we have too in the past, but I doubt our marriage could survive another afternoon sat in traffic completely lost on the French equivalent of the M25. It can never make financial sense to drive to Alicante as opposed to flying and renting a hire car. However, we like the journey and the unexpected things you see on the way. We also like the freedom of being able to change our plans at a moment’s notice and take odd little detours. Here’s a little unplanned detour- well, as you can see we were a little lost somewhere in northern Spain with the snow covered Pyrenees in the distance. That GT86 can go anywhere! We normally take in a motor museum on our trips but alas on this trip we didn’t. However, the Dali Museum in Figueres did yield this little artistic gem. My photo doesn’t really explain it and neither does this video I suppose, but at least the video shows why it is called the Rainy Taxi. Oliva, where we have an apartment. There seems to be a good classic car club down the road in Denia. Shame about Brexit. My son took this photo. No Photoshop involved, just careful positioning of the car and camera. 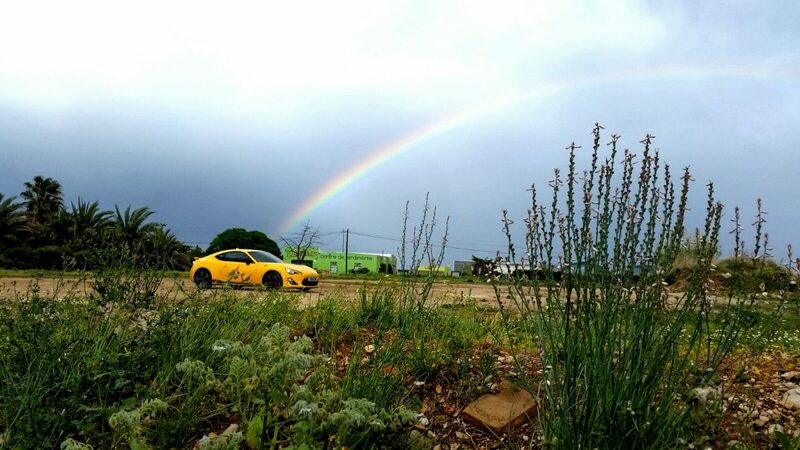 A real crock of gold. We’ve driven over the Pyrenees before but only in the summer and were surprised there was so much snow there still. On a road trip the music is all important. When I first bought the Giallo I thought the audio unit was very weak and there was also no built-in sat nav so I bought a Clarion NX302E head unit. This gave me a Bluetooth connection to my phone for Spotify and phone use, a rear view camera and European maps. The sound quality was immediately better, however, the unit really is disappointing. The main problems concern the number of clicks (stabs with your finger on the display) that you have to make to change anything. When you’re driving fast on the wrong side of the road in a foreign country you don’t want to be distracted by a slow reacting interface. The things that irritate me most are that you cannot quickly change the maps from North Up to Direction of Travel Up and you cannot easily zoom in and out. Also, you cannot easily turn the volume off (really! there is no Off button, only a temporary mute button). OK there is a volume off setting, but that is buried deep in the system settings and you cannot navigate to those easily when driving. The radio is ridiculous – there are pre-sets but they are not easy to set (which you need to do when you leave the UK) and there is no auto tuning facility and no tuning knob. The Bluetooth is also flaky and the unit doesn’t fit the dash without spacers either side. Why did I buy it! So, for the next roadtrip in June to Italy I want to get something different. Not sure what yet but it’s sure to have some hard buttons on it, not just virtual buttons and if I cannot get what I want I will ditch the sat nav and use my phone and settle for a good audio system. I’m not sure these all-in-one things are any use at all. Rant over. Apart from the head unit everything else on the car worked perfectly and it got a lot of admiring looks along the way and favourable comments at service stations. As on previous visits to France and Spain we didn’t see one other GT86 or BRZ. Well, come to think of it we didn’t see one on the way to and from Folkstone either. We saw lots of Porsches and BMWs. Common as muck they are. So another good trip, but at the end of the journey – What a mess! Next Next post: What’s red and Italian?